You can make nice thin crepes using a regular non-stick pan. However, I have a crepe pan and it makes beautiful thin crepes. You can use a crepe stick to spread the batter--just be gentle and quick when you are doing this. However, you can also use your wrist and swirl the pan quickly in order to coat the entire pan with the batter. It does take a little practice to make round and thin crepes. Once you have made a few crepes you can estimate how much batter you will need for each one. Initially you can pour the batter into a small container and use this as your measuring device for consistency. I normally use a medium size ladle. The initial crepes may not look so good but they are still tasty so don't discard them. You can pour your filling on top and eat them! Also, if your crepe is not perfect, roll the worst looking side first and no one will know except you. I tend to cover my crepes instead of flipping them to cook the other side. Sometimes I like to dust my sweet crepes with some confectioner's sugar (also known as powdered sugar or icing sugar). I put about 1/2 a tablespoon of powdered sugar in a fine strainer about a foot over my dish and tap the edge. If I have herb and flowers available then I use them for garnishes. These item (s) make a nicer presentation. I normally use all-purpose flour to make my crepes. However, one day I ran out of it and substituted cake flour since that was available in my kitchen. This works equally well. You can make more crepes by doubling the ingredients in this recipe. 1) Pour milk into a medium size bowl. Stir flour in slowly while whisking to blend the ingredients together. Stir in eggs and salt (and sugar if making sweet crepes batter). Cover and let the crepe batter rest in the refrigerator for about 10-15 minutes before using. 2) Heat a pan over medium heat. Grease the pan as needed (I normally dab a piece of paper towel with some olive, canola, or vegetable oil and wipe the pan surface with this). 3) Once the pan is hot, stir the batter a few times to incorporate all ingredients and add a ladle (roughly 4 tablespoons) of batter in the pan. Use your wrist to swirl the pan quickly to spread the batter evenly. Any extra batter in the pan can be pour out of it and back into the batter bowl. Cook for about a minute. Either flip the crepe gently or cover the pan and cook for another 30 seconds to a minute. 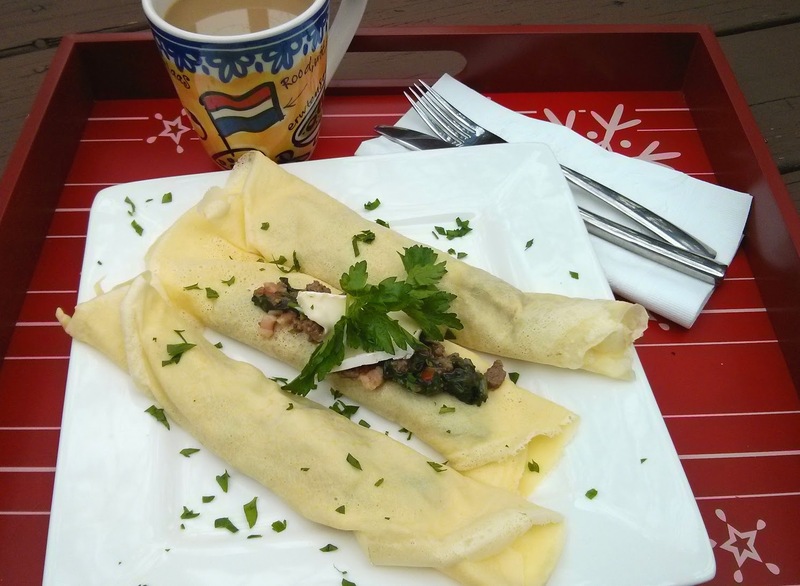 4) Remove the crepe from the pan and add the filling (of your choice), roll or fold the crepe (in half or quarters). Repeat the process until all the batter is gone. Any time your batter gets too thick then add a little more liquid (about 1-3 tablespoons) to help thin it out. *If you add another 3 tablespoons of liquid to the crepe batter then you can easily make 7 crepes with this recipe. *When I was on Maui I had access to a large organic fig tree with many fruits. I would harvest a gallon bag of ripe fruits at a time, washed, halved each fruit and cooked them (about 1/2 hour) without adding water or sugar. Once it was cooled I kept this sauce in an airtight container in the refrigerator for about a week. When ready to eat I spooned out what I needed. For the crepe sauce (as seen in above photo) I added a little sugar, a mixture of cornstarch and water (to thicken the liquid) and heated it. My husband enjoyed adding a little of the plain fig sauce to his breakfast yogurt. I used some of the plain fig sauce to make delicious smoothies.